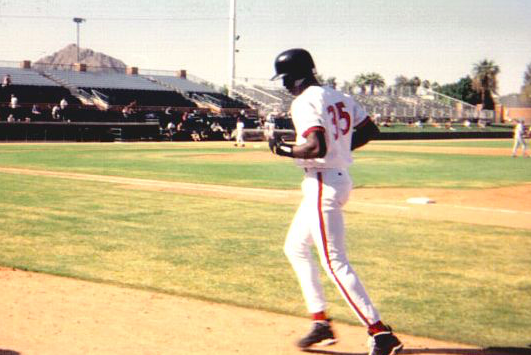 Michael Jordan plays with Scottsdale Scorpions in Arizona Fall League in 1994. Outside the sport of debate, Michael Jordan is undoubtedly the greatest basketball player ever to grace an NBA court: Five MVP awards and six championships over a career that spanned 15 seasons. He created the commercial force of the megastar athlete and is the yardstick against which every great NBA player has been measured since his playing days. So why is Will Smith making a movie about MJ's pretty forgettable — and to NBA fans, very disappointing — minor league baseball career? Wasn't that summed by "Space Jam," where he's portrayed as a legend so revered that even his opponents fawned over him as he stood in the batter's box? Jordan, 54, is an NBA owner and a global brand with plenty of good years ahead of him. The biopic treatment he gets will eventually be comparable to what we saw in the years after Steve Jobs' death, but for now, Jordan's stint with the Birmingham Barons, the Double-A affiliate of the Chicago White Sox, represents the most interesting period of adversity in his personal life. On Monday, the release of the 2017 Black List gave us a look at what's coming down the pike in the film world. It's all the scripts Hollywood executives are anticipating that have yet to begin principal photography. This year's list includes "The Prospect," a screenplay written by Ben Epstein about Jordan's escape from basketball following his father's murder in the summer of 1993. The Bulls had just won three straight NBA titles and Jordan, 31, said he had lost his desire to play the game. What stands out most about Jordan's detour on the diamond is not his stats, which were pedestrian, at best. He had a .202 average, three home runs and 50 RBIs in 127 games (although he did hit .252 during a less-remembered Arizona Fall League appearance with the Scottsdale Scorpions). The impressiveness of Jordan's baseball career is that he hadn't played the game since high school. He pursued it again because it was his father's dream to play himself. A year later, of course, Jordan's two-word "I'm back" press release set in motion a storybook return to Chicago, where he went on to win three more rings. Will Smith's involvement in the film project comes through his Overbrook Entertainment, which likely picked up Epstein's script because both men are clients of Creative Artists Agency and Think Tank Management and Production. Overbrook Entertainment was founded in the late 90s by Smith and Temple University alum James Lassiter, who met Smith through DJ Jazzy Jeff. The company has produced hits including "Love & Basketball" (2000), "Ali" (2001) and "The Pursuit of Happyness" (2006). There is no immediate timeline for this project. Smith, who's preparing for the release of the Netflix original "Bright," has plenty of other work on the horizon. But in a country that loves baseball movies, a film about Michael Jordan's brief career will probably play pretty well.